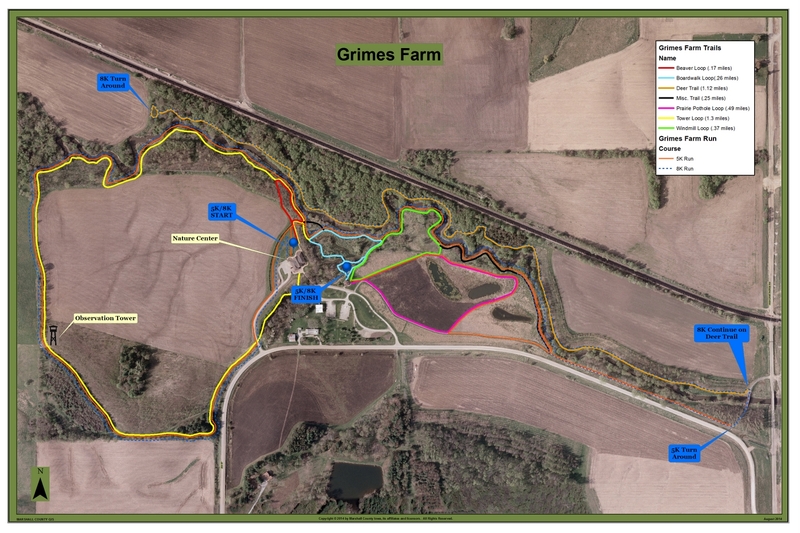 The GrimesFarm Conservation Area is located just west of the city limits of Marshalltown. It lies on the west side of Highland Acres Road and on the north side of 233rd Street.When Leonard and Mildred Grimes purchased their farm west of Marshalltown in 1964, they began the work to heal the then existing abuses to the land. Over the years soil erosion has been reduced by planting grasses, using no-till agriculture practices, establishing waterways, constructing terraces, building a farm pond, and planting thousands of trees. Eventually a “poor farm” was transformed into an excellent example of land that is productive, profitable, and beautiful. Beginning in 1964, the area was used as an outdoor classroom for local 5th or 6th grade students. A day spent in this “classroom” was coordinated by the public school teachers assisted by guest instructors from the Iowa Department of Natural Resources, the Natural Resources Conservation Service, and the Marshall County Conservation Board. Together they have helped the students understand their relationship to soil, air, water, sunlight, and all living things. In 1992, Leonard and Mildred Grimes began donating parcels of 160 acres of land to the Iowa Natural Heritage Foundation. A reserve life-estate retains use of most of the land and farm income for as long as either of them lives. activities, and houses the Marshall County Conservation Board administrative offices. Today thousands of students in all grade levels enjoy this outdoor classroom. Displays will continue to evolve over the years. Hiking trails provide access to the forests, wetlands, prairies, and crop fields. Public interpretive programs are scheduled periodically throughout the year.